Last night I went to O'Connell's Bistro and drank absinthe. I am fine but I think my computer apparently drank more absinthe than I did. Because I cannot figure out how to load up my pictures! OK, above is one, of me drinking absinthe. It turns you into a different person! And here is bartender Tom at O'Connell's with the absinthe thingie he bought off of eBay. It cost him $50. When I get on eBay all I look for is Leonard Pennario stuff but there is a whole other world out there! Under my computer's new rules I cannot figure out how to center this picture so here it is to the left. Bear with me. I will get Howard to help me figure this out. Don't you love when the computer changes the rules without your knowledge? It keeps life interesting. Last night was a watershed moment in my life because I have wanted to try absinthe ever since a couple of years ago when I heard it became legal. Plus I always knew I would like it. I knew just from the name. Absinthe. That is a word I love! 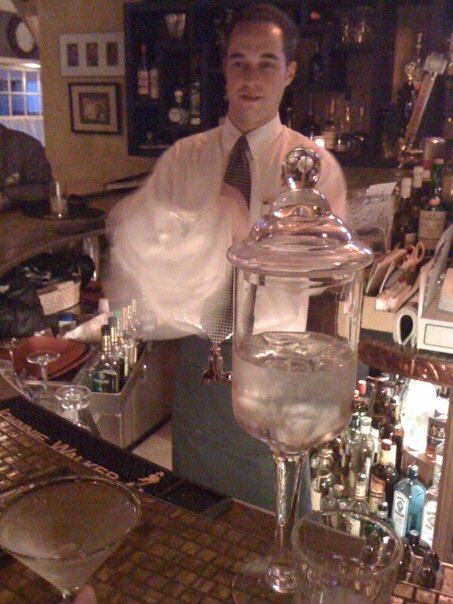 And years ago my friend Lynn and I drank in Ye Olde Absinthe House down in New Orleans. That is before I was married and my wings were clipped. 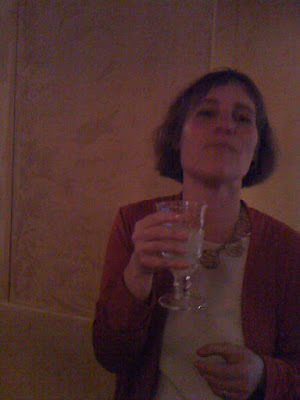 Absinthe at O'Connell's costs $12 which buys you a big glass, enough to split with all your friends. We were all passing it around. It is a cloudy green color and it tastes like Sambuca, is what I have learned. I like that licorice taste so I was right all these years, I always thought I would like absinthe, and I do. One thing, though, it made me start talking. I talked and talked and I could be wrong, but I do seem to remember mentioning Leonard Pennario. I know, that is hard to believe. That stuff can go up to around 150 proof! Hope you put some water in it. The Thujone in it can be quite psychedelic for some. This computer does not drink, like me, but does seem to love pizza in the keyboard, lol! Oh dear, first paragraph. I think it's "upload" not "load up'. Absinthe doing its job? Hmm... two booze posts in a row. Is everything OK, friend?